Wholesale Chrysanthemums are sold as flowering potted plants by growers and are usually available for Mother Day. Mostly offered in decorative pots ready for sale, plugs and tube stock of some varieties are available. 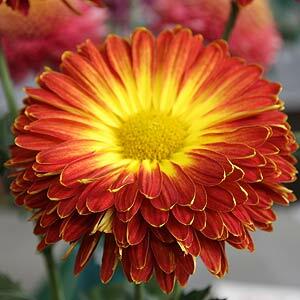 Varieties available include the large flowers ‘Ball’ types, to many other colourful and free flowering types. Smaller dwarf types are increasingly popular and are sold as potted specimens. More hardy types for mass planting are also available. Available in attractive pots for display they are the standout gift as a Mothers Day Plant and have been for many years. However they are also a hardy bunch and can be planted out into the garden in many climates. Offered sometimes in ceramic and coloured PVC pots depending on the grower they come in many flower sizes and colour. Generally available from wholesale growers from late February through to May. An early release is usually in December to cope for the Christmas market. Both compact and taller growing types are available with a focus on the lower growing varieties that do not require staking, Colour range in from white through to pinks, reds, yellows and deep red to purple depending on supplier. Wholesale Chrysanthemums – Suppliers Include.